Our first order of business this morning is to share the performance of the options we alerted on in Friday morning’s report. Those targets were the SPY Weekly $290-291.50 Calls, and they produced some very nice single session gain opportunities for ourselves and our readers. This morning we noticed that FRAN is exhibiting a number of traits that we normally keep a lookout for. The stock is coming off of a bottom with a large gap on the chart, and on Friday, the CEO filed a Form-4 for the purchase of 10,000 shares near the stock’s lows. This is often a sign of high internal confidence in the stock’s ability to rebound, so we’re going to place FRAN on recovery watch in the days and weeks ahead. FOLD is another play which also currently boasts a bottom setup, with a significant amount of insider buying taking place on Thursday at its lows. We’ll definitely want to keep this one on watch as well. Swinging back around to discuss AVEO is our top order of business this morning after the stock soared to new highs yesterday. We placed this stock on watch on June 23rd, subsequently mentioning it several times. Volume over the same period has been greatly heightened, and yesterday’s close at 3.15 was a strong one, so even though AVEO has had momentum-mover status for several sessions, we’re going to want to continue to watch it closely. 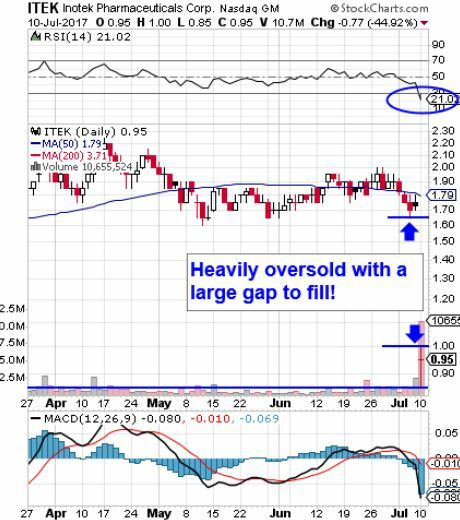 We’re always looking for a good bottom-bouncer, which is why we want to take note of ITEK this morning after disappointing study results on the company’s eye drug sent shares tumbling yesterday. Our Thursday morning we presented SHRK as a momentum play and were met with one heck of an opportunity as the stock managed to make an intraday swing of 120% from .30-.66 that afternoon on exceedingly heavy volume. We reinforced our interest in continuing to track the stock on Friday morning, provided it maintained a higher base level of support, and for the second straight day, SHRK came through for us despite choppy market conditions. We witnessed a run from .62-.85 for a solid 37% swing, and from Thursday’s observed low, it marked a two-day move of 183% Cheers are in order for anyone who has followed SHRK along with us. With another strong close Friday we’ll keep an eye on its activity as we kick off a new trading week. 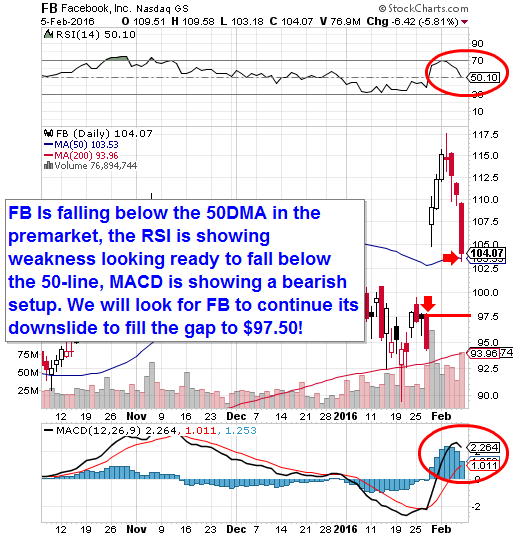 Thursday morning’s report also contained some stellar options ideas as we decided to go bearish on FB. The ranges we highlighted included the Weekly $113-110 Puts and the longer-term ideas of the Feb 19th $109-105 Puts all returned good chances for quick-strike profits. On Friday we anticipated a second consecutive day of losses for the social media giant, and explicitly stated that “We can expect to see further moves out of these contracts”. Once again our expectations were met precisely as FB continued to tumble, and extended our possible gains to an astonishing level. In terms of the February 19th Puts we signaled, we are once again reiterating our interest as we expect the gains to continue piling up as FB looks to be in line for another rough outing. We explain our reasoning for this in the following chart snapshot.